The UK’s Department for Business, Energy & Industrial Strategy (BEIS) commissioned Elsevier to assess the performance of the UK's research base compared with seven other research-intensive countries (Canada, China, France, Germany, Italy, Japan, and the US), four other fast growing nations (Brazil, India, Russia and South Korea), and international benchmarks. Emerging research nations such as China, Brazil and India have been striving to emulate the performance of longstanding research-intensive countries such as the UK, Germany, France and the US. Within this context, this report tracks investment in, and performance of, the national research system in an international setting, combining a variety of indicators to present a multifaceted factual view of the UK’s comparative performance in research as well as data about the trends that may affect, or indeed are already affecting, its position. 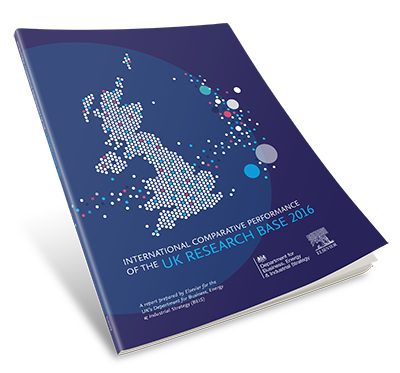 The report, 'International Comparative Performance of the UK Research Base – 2016,' is the third consecutive report in this series to be delivered by Elsevier, the first having been published in October 2011, the second December 2013. Comparisons between analyses in this report and the previous report, where provided, are noted in the context of the years of analysis of the reports. Generated by Elsevier’s Analytical Services team, the report's main themes were explored through literature reviews, in-depth interviews with key stakeholders and data analyses from a range of sources including Scopus and ScienceDirect data, R&D expenditure and human capital data from the OECD and the Office for National Statistics (ONS), PhD graduate and funding data from the Higher Education Funding Council for England (HEFCE) and the Higher Education Statistics Agency (HESA), and patent information from the World Intellectual Property Organization (WIPO).